LV-AHH Rio de la Plata . And what happened to them- they dont appear to have been bought by the Cooperativa Argentinas. I have almost given up trying to source any real info about the 'COOPS' activities. I haven't got much either on the fates of the South American Sandringham/Sunderlands so I can't add a lot as yet. 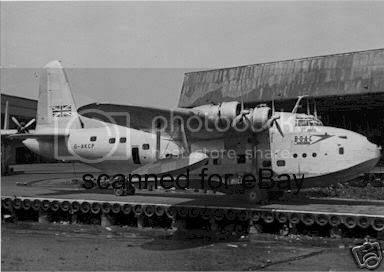 However, DP195 CX-AKR “Capitan Bosio Lanza” was originally part of CAUSA's fleet and I have a note that she was involved in a non-fatal accident at Montevideo 26-1-56 and scrapped afterwards. My list of aircraft used in Argentina/Uruguay isn't complete. Do you know the original (or at least earlier) identities of LV-AHM and CX-ANI? Sorry, I can't help much either. Have you seen the magazine Propliner 94 Spring 2003 article ‘Ladies of the River Plate’ by Michael Magnusson? The article includes this list. I can email you a scanned copy of the full article (4 pages) if you PM me your email address. Also try Googling CX-AKR Capitan Boiso Lanza - the Wikipedia entry is interesting. 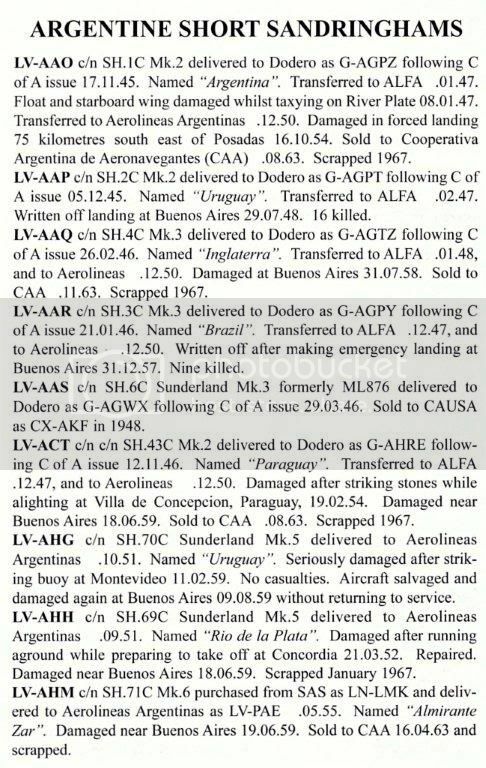 Interesting that the article only confirms four as operational with CAA - LV-AHH being laid up damaged? And I did have the link to the Norwegian Sandringham afterall: SH-71C JM714 LN-LMK LV-PAE LV-AHM. Last edited by Pondskater on Wed Aug 04, 2010 10:36 pm, edited 1 time in total. I don’t know the fate of either of them. The only photo I have of G-AKCP is this one, which is tiny and not very clear but think the name looks more like St David than St Andrew. Thanks everyone-fantastic response- Pondskater has answered the Capt Boiso query- just leaves what happened to Saint David while with CAUSA. G-AKCP which became CX-ANI. Stuck an object and damaged beyond repair on takeoff from Montevideo 25 Jan 1956. Beached and the wreck still extant in Montevideo Harbour early 1964 but later scrapped. 2 aircraft lost in a 3 month period! !